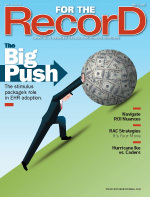 What does the president’s stimulus package mean for EHR adoption? In February, President Obama signed into law the stimulus package known as the American Recovery and Reinvestment Act of 2009. This voluminous piece of legislation includes more than 100 pages dealing directly with funding to stimulate the adoption of electronic health records (EHRs), which has been dubbed the Health Information Technology for Economic and Clinical Health (HITECH) Act. The HITECH Act has committed $19 billion to advance HIT use through monetary incentives, with up to $44,000 available per eligible physician and potentially millions for eligible hospitals that can demonstrate meaningful use of an EHR beginning in 2011. Obama has said that one of his primary goals for encouraging the national adoption of EHRs is saving money—he estimates around $80 billion per year, though that figure has been questioned. Most recently, an op ed piece published in The Wall Street Journal by Jerome Groopman, MD, and Pamela Hartzband, MD, argued that the president’s figure is exaggerated and taxpayers shouldn’t be misled to believe the act will save that much money. Obama has said his other reasons for encouraging national adoption are that EHRs will help hospitals prevent or lower the number of medical errors, reduce malpractice lawsuits, and facilitate overall better care. Tate agrees that the incentives will lead to higher adoption rates, despite the barriers. “While the implementation of electronic systems into paper-based environments is difficult and there are numerous challenges to the transition, the financial incentives are so significant that I believe we will see a large number of physicians make the move to adopt EHRs,” he says. While there are not a lot of specifics at this point, the law does state that certified EHR technology must have an e-prescribing component for physicians. It also reads that the technology must be certified and interoperable, says King. As more guidelines are established, Daigrepont says meaningful use must be balanced against productivity. For example, if the guidelines established for meaningful use slow down doctors, then there will be a resistance to adoption. Besides the incentives, there’s another reason why healthcare organizations will want to start thinking more seriously about implementing an EHR. The HITECH Act has not only provided for rewards for those who adopt EHR technology and achieve meaningful use, but it also penalizes those healthcare providers who fail to do so. For providers who have not achieved meaningful use, Medicare reimbursement fees will be reduced by 1% in 2015. The penalty then increases to 2% the following year, with more deducted with each passing year, peaking at up to 5% if meaningful use has not been demonstrated by 2018. The idea of losing money when extra could have been obtained is believed to be yet another incentive for adoption. “It’s by no means a large amount that is deducted, but it also just doesn’t make sense anymore not to adopt,” says Fox.